Ukulele instruction is offered as a weekly 30, or 60 minute private lessons. Beginner, intermediate, and advanced lessons are available in a variety of different styles such as alternative, pop, classical, jazz and more. Whatever your goals are, our teachers are here to help you and customize a lesson plan for you. Beginner Ukulele students of all ages will learn how to read standard and tab notation, play melodies, chords, and improvise. All students are highly encouraged to bring recordings of their favorite songs, band, or players to learn their favorite songs. Custom tailored curriculum will be provided to ensure a well-rounded musical development. Guitar lessons for intermediate to advanced students will focus on expanding technique, repertoire, theory, and learning to transcribe. Intermediate students are typically graduated out of using method books and starting to learn more complex pieces of music. Our awesome instructors can help give you the skills, knowledge, and confidence to take out your ukulele and play your favorite songs for family and friends. The ukulele is also a great instrument for kids and adults to learn. 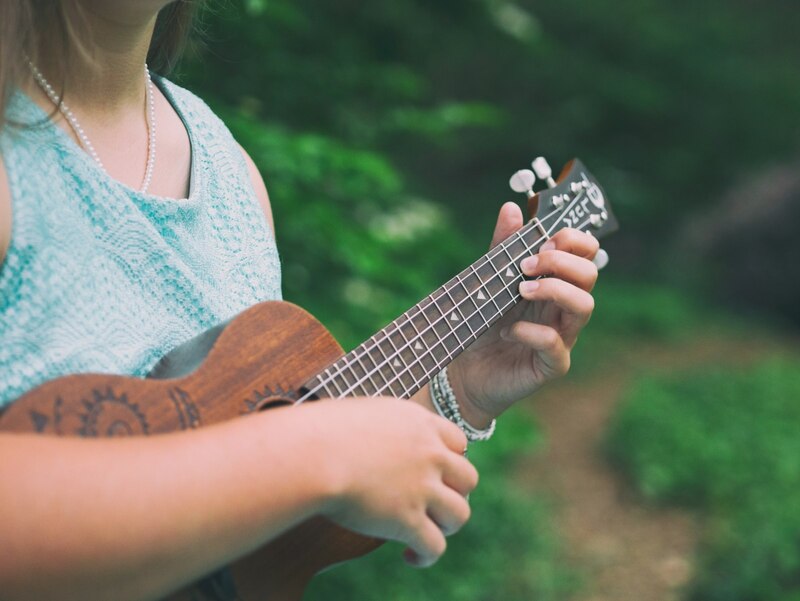 They are affordably priced and easier to play than a guitar, so ukulele lessons are a fun way for kids to get started before taking guitar lessons. WHAT IS A GOOD AGE TO START THE UKULELE? Ukulele is one of the best instruments for a young student to learn — because it’s size and simplicity, we often recommend that children start with ukulele lessons first before switching to guitar. The nylon strings of a ukulele are softer and easier to press down than guitar strings, making it easier for children who haven’t built up the finger strength required for guitar. Since ukulele is a chord-based instrument, you can create ukulele arrangements for pretty much any song! Your teacher might make some suggestions when you first start out, but once you know a few chords, you’ll be able to play any songs or styles of music you’d like! WILL I NEED TO BUY AN INSTRUMENT? Yes. We do not provide instruments for our students to take home, so you will need to purchase or rent a ukulele. Fortunately, ukuleles are fairly inexpensive — you can buy a beginner ukulele for under $50! If you don’t have a ukulele yet, don’t worry! We actually recommend coming in for your first lesson before you buy an instrument, so our teachers can help you know what to look for and where to shop. Our teachers will let you try out their own ukulele during your first lesson.